An automatic coffee maker performs a whole range of functions from grinding to self-cleaning. There are even machines, which cook several types of hot drinks at a time. High price is the only bad thing about an automatic espresso machine. The whole process (bean to cup) takes up but 30-40 seconds. Your ideal espresso will be ready in 30 seconds! Automatic on/off. You can set the time the machine automatically starts heating up in the morning and stops heating at night. Actually, all automatic coffee machines are similar and make equally good hot drinks. The only things, in which models of various price categories differ, are appearance, size, and functionality. For example, Philip Series 2000 HD8649, the cheapest super automatic espresso machine as of 2016, has no strength adjustment function and brews only grain coffee and only espresso. However, you can make milk-based drinks manually using a built-in milk frother. Vice versa, the most expensive – Delonghi ESAM 6904 – features a LCD screen, sensor buttons, and two temperature modes. 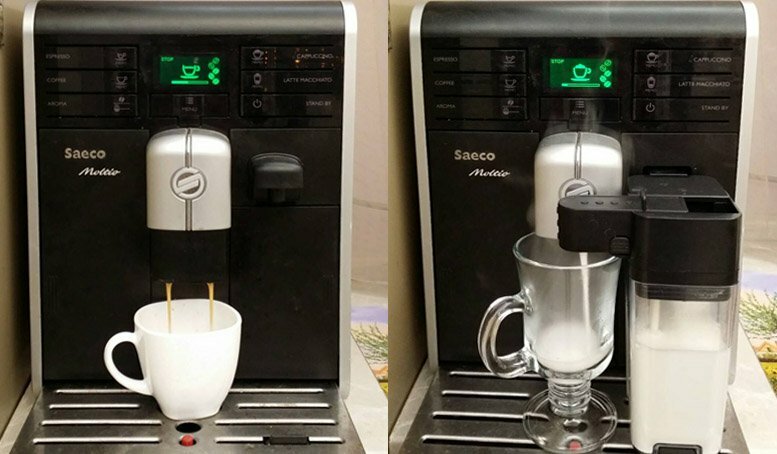 It selects crema thickness and can even make a hot chocolate drink in just one push of a button. However, they make coffee of similar quality and at a similar rate. Select a super automatic coffee maker based on the price/functionality ratio. With all else being equal, we recommend a metal body machine featuring a ceramic grinder, providing sufficient cup height, high pressure and power. Prior to purchasing, please, check the steam frothing tube, open and close water/bean/residue containers, and all check buttons.